Jen Namoff stands alongside Helen Witty's family. Co-founder of Soffer/Namoff Entertainment Jen Namoff once found a safe haven in room 118 at Palmetto; now she leads the busy life of a highly acclaimed Talent Manager and Producer in the Big Apple. Over the phone, I hear an automated female electronic voice requesting change. Although she can now navigate the New York City roads and regularly works with her famous clients – Javier Munoz, the current “Hamilton” lead, Tituss Burgess from “Unbreakable Kimmy Schmidt,” Jack Falahee from “How to Get Away With Murder” and stars from “Grey’s Anatomy,” to name a few – she was once a Palmetto Panther under the guidance of then drama teacher Rick Adams. She graduated in 2002. “He was an incredible inspiration to all of us, and I still keep in touch with some of my comp buddies, my troupe 1298,” Namoff said. Without the troupe – and without her teacher – Jen may not have followed the path that led her to her current position. As a manager, she communicates with actors on Broadway, television and film, and she produces for Broadway and film as well, including her Broadway revival of “How to Succeed in Business Without Really Trying” (originally starring Daniel Radcliffe), which was selected as a nominee for Best Revival of a Musical at the 2011 Tony Awards. But at Palmetto, she started out with her eyes on acting, before realizing at Syracuse University – her alma mater – that she really wanted to pursue directing. She graduated with a double major in acting and directing along with a degree in communications. It was not until after her big move to NYC that she began interning, gaining experience on the business aspect to theatre, and while working for casting directors, someone suggested she pursue a talent agency. She worked for four years as an intern at the talent agency Leading Artists, and found herself moving toward managing, where she would be free to combine her work with actors with her creative mind for production. “The manager is the captain of the ship,” Namoff said. But her inspiration to pursue directing went much deeper than simple job-searching. During Jen’s sophomore year, she lost her best friend. The entire Palmetto family mourned the loss of the beloved Helen Witty, who was hit and killed by a drunk driver while she was rollerblading. Her passing away devastated the community and left a significant imprint in Palmetto’s past. Namoff attributes the majority of her own success to the respect she always held for Helen. Although she only had two years with Helen – up until their sophomore year – the impact she had on Namoff ignited in her a burning desire to do more. 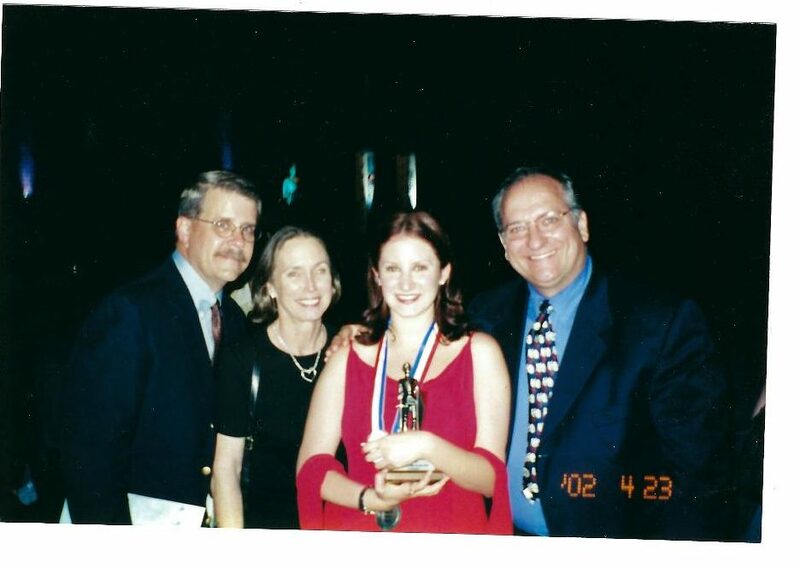 During her time as a Palmetto student, she performed as Yente in “Fiddler on the Roof” and won best supporting actress – a trophy that still sits in her childhood home – and she also participated in “Anything Goes,” the Florida State Thespian competition, and the Florida Theatre Conference. Although drama teacher Robin Barson never taught Namoff directly as a student, the two met when Namoff was just fourteen years old at the JCC working on “Fiddler on the Roof” and has played a prominent role in her life. Like Witty, Namoff admires Barson’s undying love for theatre. The drama troupe served as her anchor for the four years she spent as a thespian. Namoff’s words of wisdom are enough to inspire anyone with massive ambitions to go out and take life by the horns. One thing Jen Namoff knows for sure: Palmetto remains a part of her through her journey as a thespian and as a professional.